Jill Abramson, who was fired as executive editor of The New York Times last week, doesn't know what she'll do next. But she knows she won't be getting her tattoo of the newspaper's logo removed. 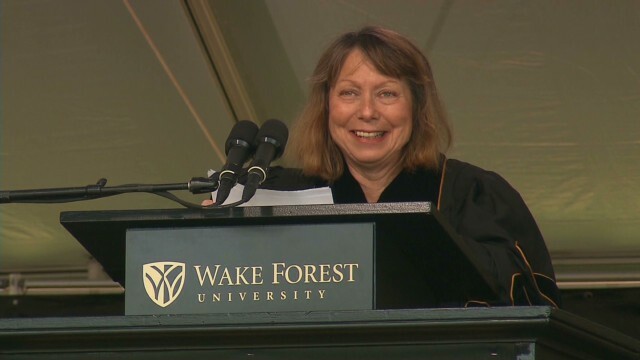 Abramson spoke for the first time about her abrupt dismissal during a commencement address at Wake Forest University Monday morning. She joked about the timing of the address. "I think the only real news here today is your graduation from this great university!" she told the graduates. She then spoke at length about the topic of resilience, citing her own experiences at The New York Times. Abramson did not speak an ill word about The New York Times or its publisher, Arthur Sulzberger, Jr., who forced her out after fewer than three years as executive editor. She praised the newspaper and said "it was the honor of my life to lead the newsroom."